Sunflower oil is obtained from seeds of well known to us all plant. Obviously, we are talking about sunflower, yellow flower cultivated around the world. Sunflower oil is extracted in the process of mechanical cold pressing – in this form has the highest amount of nourishing ingredients. It has yellow colour and characteristic scent. It should be stored in cold and dark place. 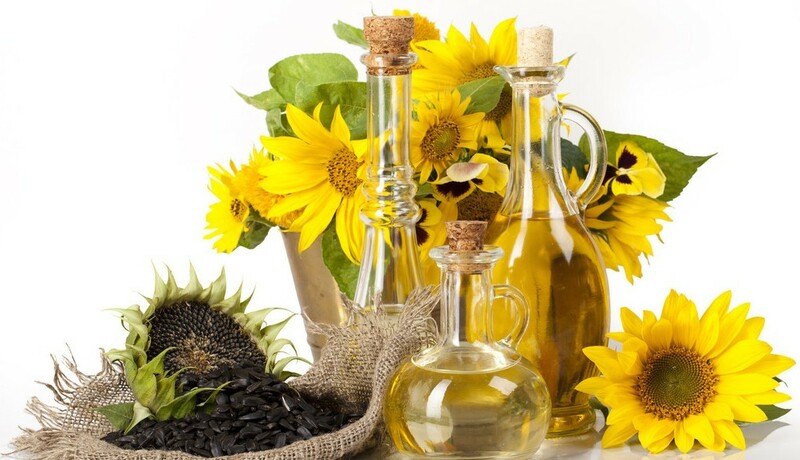 Sunflower oil can be used both in cosmetic and food industry. Yet, remember that cosmetic oil differs a bit from oil used for frying. Cosmetic oil is usually unrefined, i.e. wasn’t purified, thanks to which it preserves many valuable properties and ingredients. Among ingredients in this oil, we will find: saturated and unsaturated fatty acids, vitamin E and minerals (selenium, zinc, copper and iron). Oil used for food is being refined to change the amount of oleic acid in it. Food sunflower oil, cannot be used for cosmetic purposes. What properties has sunflower oil? It has mostly moisturising and cleansing properties, but also strengthens lipid barrier of epidermis, prevents mechanical and chemical damages. Sunflower oil protects hair against sun radiation, impurities from air and other harmful external factors. It slowers ageing processes of skin and hair, eliminates free radicals and supports skin cells regeneration. It soothes irritations, eliminates inflammations and calms skin allergies. Sunflower oil has normalising, antiseptic and anti-inflammatory properties. It regulates work of sebaceous glands, limits sebum secretion and helps with dandruff. Furthermore, sunflower oil provides smoother, gloss and easier stylisation. It seals hair cuticles and helps tame wild hair, including so called baby hair. Sunflower oil can be used in more treatments than just scalp and hair conditioning. It is very good preparation for massage, make-up removal or face cleanse with OCM (Oil Cleansing Method). Product will easily spread on the surface of skin of the body and face, absorbs fast and doesn’t leave greasy layer. It can come handy in fight against acne and blackheads. Equally popular is oil pulling with sunflower oil. This way you restore and strengthen natural microflora of oral cavity.